MATHCOUNTS is a valuable school-based program that gets students interested in math through clubs and competitions and helps them achieve both academic and personal goals. Find out more about this national program in this exclusive LoveToKnow Interview with Archana Mehta, the program's Director of Marketing. LoveToKnow: Who started the MATHCOUNTS program and when? Archana Mehta: It was started in 1983 as a collaboration between the National Society of Professional Engineers (NSPE), the National Council of Teachers of Mathematics (NCTM) and the CNA Insurance company. All three founding sponsors are still active 26 years later! The program started out as a competition program only. In 2007 we launched the Club Program to go along with our original Competition Program. LTK: Could you talk briefly about the Foundation? AM: MATHCOUNTS is a national enrichment, club and competition program that promotes middle school mathematics achievement through grassroots involvement in every U.S. state and territory. The Foundation is a nonprofit organization incorporated in 1984 to promote math excellence among U.S. middle school students. The Foundation's headquarters are located in Alexandria, Virginia. LTK: When and where are the competitions held? AM: The Competition program takes places on four different levels - School, Chapter, State and National. The School Competitions are typically held in January so the school can determine which students will represent that particular middle school at the Chapter Competition. Schools may send a team of four students, as well as four students competing as individuals, to the Chapter Competition. The Chapter Competitions takes place at over 500 locations throughout the country in the month of February. State competitions take place in March in all 50 states, DC, Puerto Rico, Guam, Virgin Islands, Northern Mariana Islands, Defense Department Schools and State Department Schools for a total of 57 events. The top four finishers at each of the 57 State competitions get an all-expense paid trip to the national competition in May. Nationals are held in different locations each year. LTK: What grades are allowed to participate in the competitions? AM: The competition program is available to any student in 6th, 7th, or 8th grade. LTK: How are students recognized for their participation in the program? AM: Students are awarded through certificates of participation, ribbons, trophies, calculators and scholarship money. Schools can also receive monetary awards, trophies and banners for participation as well. 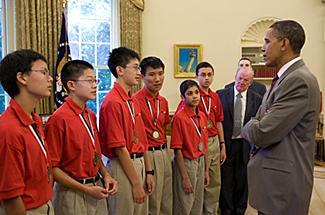 LTK: What is the biggest benefit for a student for being in the MATHCOUNTS program? AM: By engaging students at the critical middle school age, our programs build foundations in critical thinking and problem solving that will help students succeed in the classroom and later in life. LTK: How is the program funded? AM: The Foundation is primarily supported through the generous contributions of individuals, corporations, associations and foundations. All donations are tax-deductible. LTK: Who are some of your largest sponsors? AM: A few of our largest sponsors are Raytheon Company, National Defense Education Program, Northrop Grumman Foundation, National Society of Professional Engineers and CNA Foundation. LTK: What are the different ways for people to get involved in the program? Please visit our website to learn more about becoming involved in our program. LTK: How could an interested math teacher find out more about this program? AM: The best way to get more information would be to visit our website. In addition to finding out how to sign up for the competition program or the free club program, there are lots of free materials to go through. For anyone looking to practice math skills during the summer, it's a great resource! Developing strong math skills can help tweens prepare for success in high school, college and beyond. 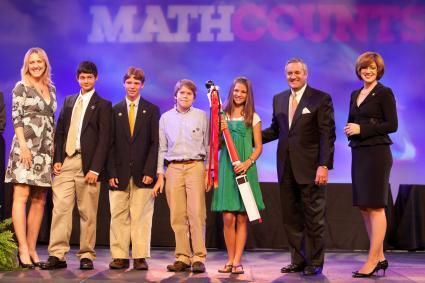 MATHCOUNTS provides a great way to help students strengthen their skills and earn recognition for their efforts.